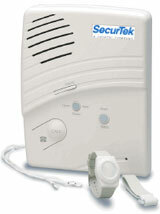 The SecurTek Medical Alert system is an ideal solution for people who want personal emergency protection in their home. This affordable system allows you to report an emergency even if you can’t get to a phone. You can get medical assistance at the press of a button, meaning family and friends will rest easy and you’ll be able to live in your home independently and without fear. The control Panel reports an emergency after you press your personal help button or the panel call button. The panel receives a signal and sends an emergency report to the central monitoring station. The panel’s two-way voice speaker will allow you to talk to the central station attendant, without having to pick up the telephone. The personal help button keeps constant contact with your control panel when you are in your home and has a receiving range of up to 150 feet. It may be worn on the wrist, as a pendent, or on a belt, or can be mounted on the wall. When the button is pressed, an emergency signal is sent to the monitoring station in a matter of seconds. • Family and friends can use the Check In Feature to communicate with you through the panel’s speaker. • Equipment can be installed to monitor activity during a set time period and if the system does not detect any activity, one of your contacts will be notified. • Medical reminders alert you when it’s time to take your medication. • You have the option of purchasing or renting the equipment. • The central monitoring station is staffed 24/7 to handle emergency calls. • Plus, the whole system is easy to use. Do you need a Medical Alert? Having trouble deciding if a SecurTek Medical Alert is right for you or someone you care about? Read through the following 8 statements and answer “YES” or “NO”. 1. Has this person ever been hospitalized, experienced a fall or required emergency medical assistance? 2. Does this person use a wheelchair, cane or other device to assist with movement on a daily basis? 3. Does this person live alone? If the person does not live alone, do they spend more than 4 hours alone during the day or night? 4. Does this person take medication on a daily basis? 5. Is living independently and remaining in their home important to this person? 6. Does caring for this person cause you stress and worry, wondering whether they will be okay if you're not around? 7. Does this person have a chronic medical condition that could require emergent care? 8. Does this person require assistance with regular daily routine activities like cooking, cleaning, bathing or eating? Tally your totals. If you answered “YES” to more than 3 of these questions, this person will benefit from a SecurTek Medical Alert system. Live Life Your Way with a SecurTek Medical Alert. It’s easy to use and gives you and your family great peace of mind. Contact us to find out more about SecurTek Medical Alert. © 2007 - 2018 HawkEye Security. All rights reserved.